never use windows for installations..
.. unless you want to be embarrassed from time to time. i fought hard for only using linux and macs for installations at igd. normally drivers or a claimed ease of use are the arguments for windows. but you are paying the price soon. 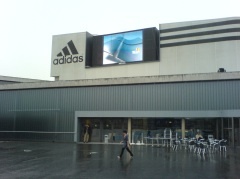 in this example the public screens at the adidas store are showing a windows logo for several hours. whatever happened – a restart or an update – nobody reconized it. windows embarrassed me several times, too. at a talk in ascona i had to present under windows because the projector did not work with linux. the antivirus software started scanning during the presentation. it took about 20 seconds to switch between the slides. last week i showed an augmented reality demonstration to european reviewers at a cultural heritage site in italy on a sony ux micro pc with windows vista. it worked great but when i restarted the computer afterwards microsoft’s wga thought i do not have a license anymore and shut it down. that was close. 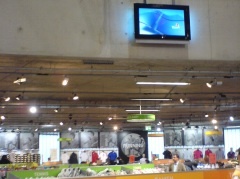 the coperion installation – a multitouch table and a 8 meter wide hd projection – ran on ubuntu linux. it worked like a charm for 10 days.